Its been about 6 months from the time you adopted those cute little baby chicks, and now they are all grown up and ready to start laying tasty free-range eggs for you; ready to find the best chicken nesting box?! But how many nests do you need per hen? There is much debate about this topic. Some people say you need 1 nest per hen; however, you’ll commonly find that two or three or more hens end up using the same nest! In our experience, we’ve found that 1 nest for every 4-5 hens is sufficient. You’ll know if you have too few when they start laying on the ground or under bushes outside or there are two hens trying to use the same nest at the same time! So a 4-hole nest box should cover your flock of 16-20 hens. There are many different nest options on the market. The plastic are by far the cheapest, with 1-hole being popular (the plastic injection molding for larger nests is cost prohibitive). There are also the 5-gallon bucket nest lids, that converts your everyday bucket into a laying nest. Wooden nest boxes are the next affordable option. These are something that can be built at home if you are into DIY or found at your local farm and feed store. Finally, the galvanized metal nest boxes. This is our nest box of choice because they are weather and rust resistant and last forever! They do not rot or warp like wood can and look nicer than plastic. They can be be easily cleaned by hosing off and the nest bottoms are often removable for nest bedding replacement. We offer Little Farmer Products nest boxes in powder-coated Red and Green, in addition to Brower Equipment metal nests. Brower offers a 1-hole and 10-hole roll-out nest option which are very useful for egg collecting, keeping the eggs clean and preventing egg-eating. We recommend installing about 2 feet from the ground on the wall of the coop, as it provides a great level for collecting, cleaning, and observing. If you utilize the Brower 1-hole roll-out nest, it can be fitted to roll out to the front or the rear. The hinged perches are great for folding up the nests at night so that the hens don’t roost inside the nest hole or on the perches themselves. For nesting litter, many people use hay, washable plastic nest pads, or wood shavings. 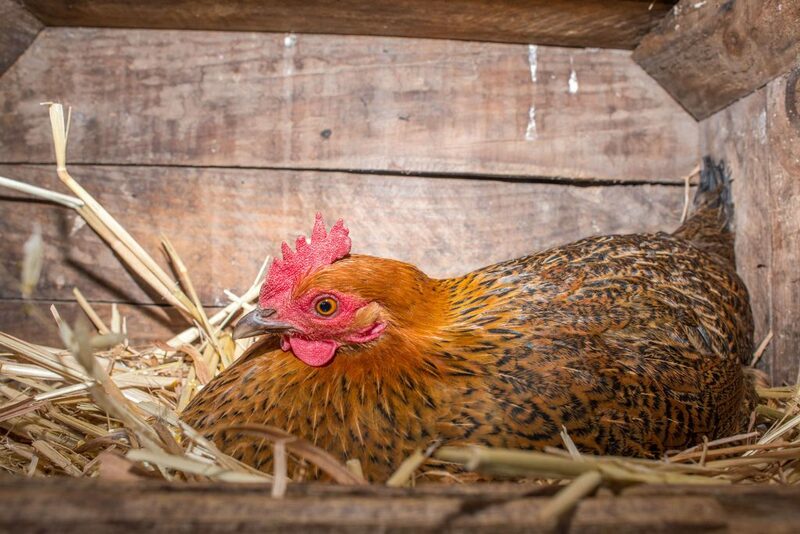 You can create a pleasant laying environment for your girls by sprinkling some dried botanical in the nest, such as Scratch & Peck’s Organic Coop Confetti or The Chicken Chick’s Spruce the Coop.